Ombré bleaching of clothing (sometimes called "bleach dyeing") is a popular fashion trend where the color on a garment gradually fades in color from top to bottom, or from bottom to top. This effect is created by using bleach to alter the color dyes in the fabric. 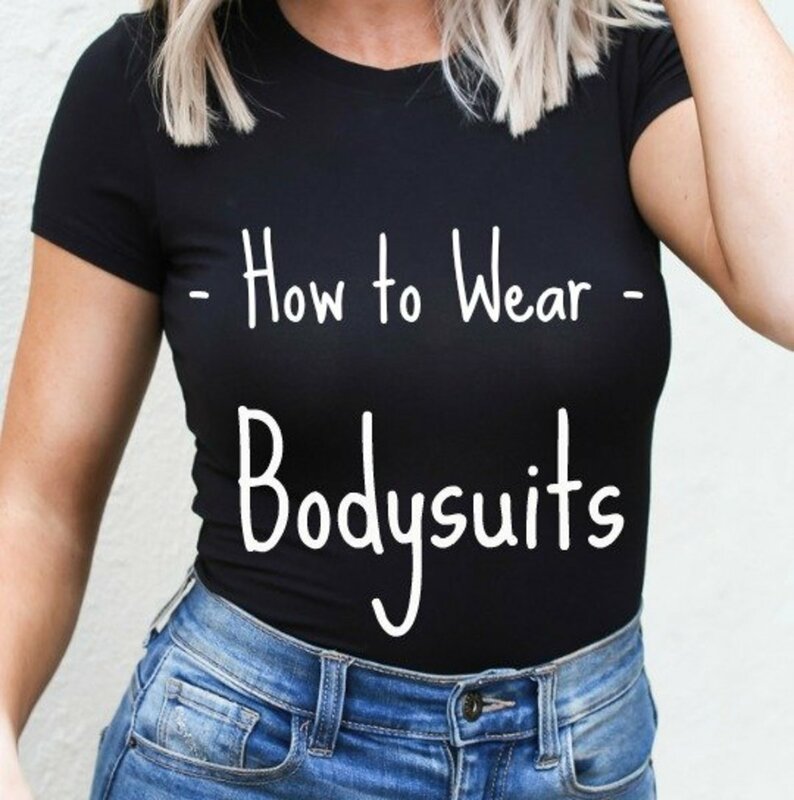 These clothing items can retail for hundreds of dollars, but this technique is easy to do yourself using household supplies. This fashion trend might not appeal to everyone, but the results can be quite pretty. Please keep in mind - when bleaching an item of colored clothing, you really have no idea how the colors might change. You can take a black shirt and put it in bleach, thinking that it will turn to a lighter gray. However, you may find that the black color of the original shirt was actually a deep color of purple and after bleaching, you now have a lavender shirt. So for this look and technique, you just have to keep an open mind and love the results of the bleaching, however it turns out. a colored shirt - this can be any type of shirt. You may want to use a couple of old shirts first as test runs before trying this technique on any clothing that you truly treasure. one or two large, clean buckets - you can do this technique with one bucket, but it is easier with two so that you don't have to run to change the water. I would suggest you work outside for good ventilation, since you are handling bleach. A well lit area is best with a table top that you can use. Cover your work area with newspaper in case your bleach drips or spills. I would also suggest wearing old clothes and/or an apron while you work to protect your clothing. Be sure to always wear your safety goggles and gloves when handling the bleach, the bleach mixture, or your wet piece of clothing. 1. Make sure your item of clothing is freshly clean and dry. You can use any type of shirt, however a heavier shirt (like flannel or denim) will probably take longer to change color. 2. Decide where you want to start your ombré bleaching on your shirt. I put my shirt on and decided that I wanted the color change to start between my second and third buttons from the top of my shirt. You can also bleach your shirt from the bottom to the top by putting your shirt in the bleach mixture upside down. Also decide whether you want to bleach your shirt's sleeves along with your shirt, or leave them as is. 3. Then, if you are bleaching your shirt from the top down, put your shirt of a well-fitting hanger and button it (if applicable). 4. Put on your gloves and goggles and keep them on throughout the bleaching process. 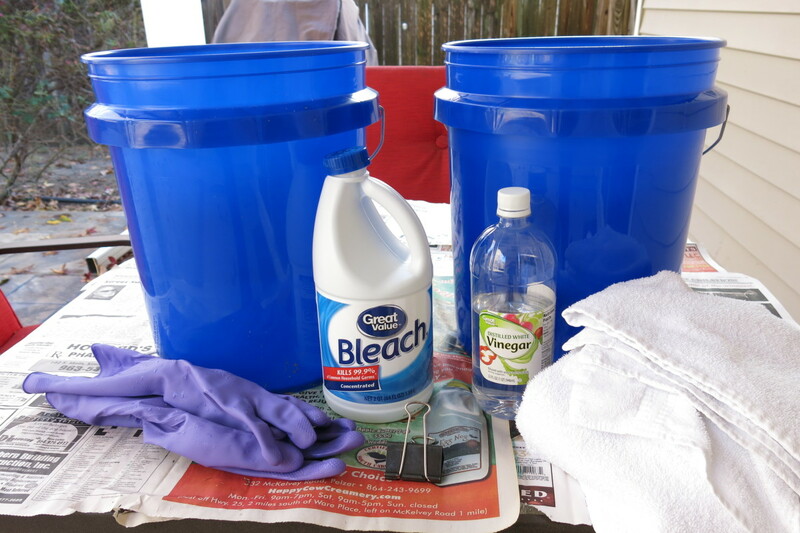 Then, in a clean bucket, make a generous mixture (enough to cover the area of your shirt you want to bleach) of 2/3 warm water and 1/3 bleach. You don't really need to measure this mixture. You can just approximate it. If you have another bucket available, fill this with cold water. 5. 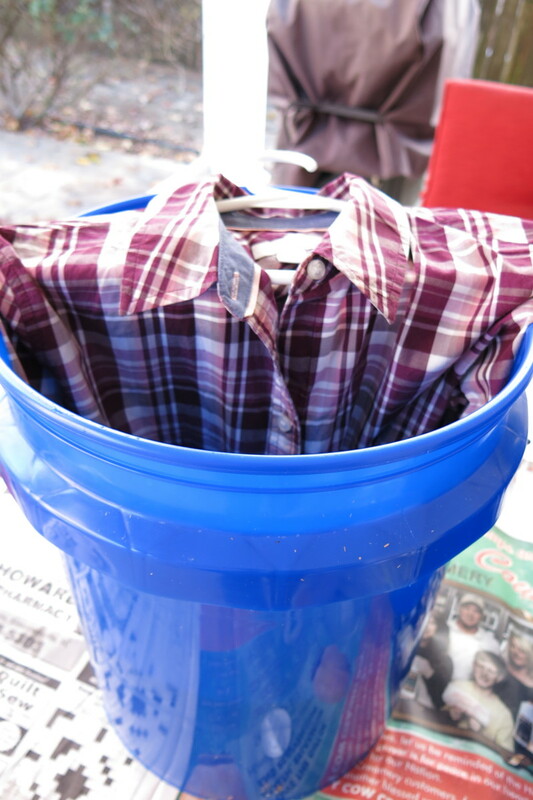 With your shirt on its hanger, submerge your shirt in the bleach mixture to the point where you want to begin your color change (if you do not want to bleach your sleeves, leave them outside your bucket throughout the bleaching). The bleach will seep up a little on your shirt, so keep that in mind when placing your item in the bleach. You can use a binder clip or clothes pin to hold your shirt and hanger in the mixture if necessary. 6. The bleach will start working immediately, so stay with your item and watch for the color change. This is why it is important to work in a well lit space. I wanted to have a very gradual color change on my shirt, with the ombré effect going through many steps. However, I didn't see how much bleaching was taking place, so I only was able to get three color changes on my shirt. 7. 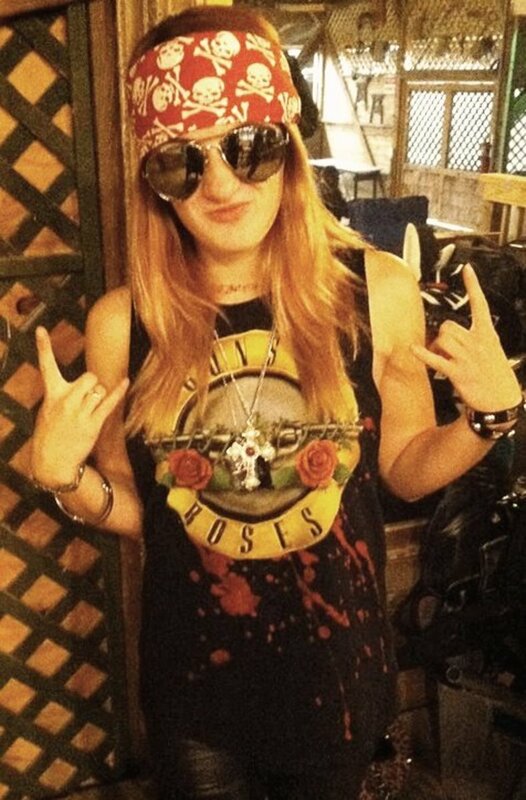 Once you see the initial color change on your shirt that you want, pull your shirt out a few inches from the bleach mixture. 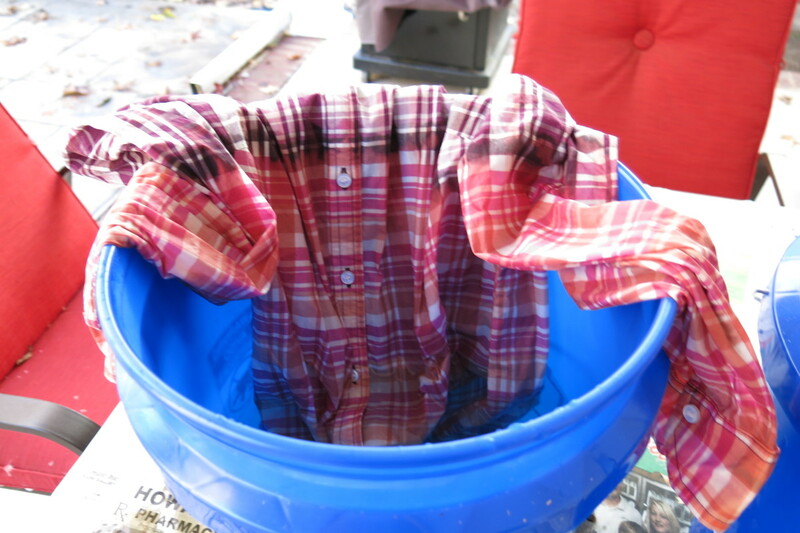 Leave the remainder of your shirt in the mixture to continue a further color change. 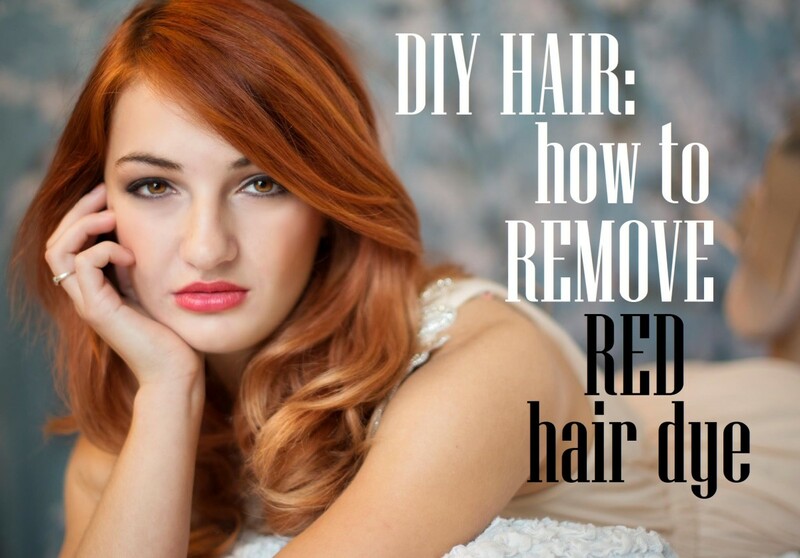 This will create multiple steps in your ombré effect. 8. 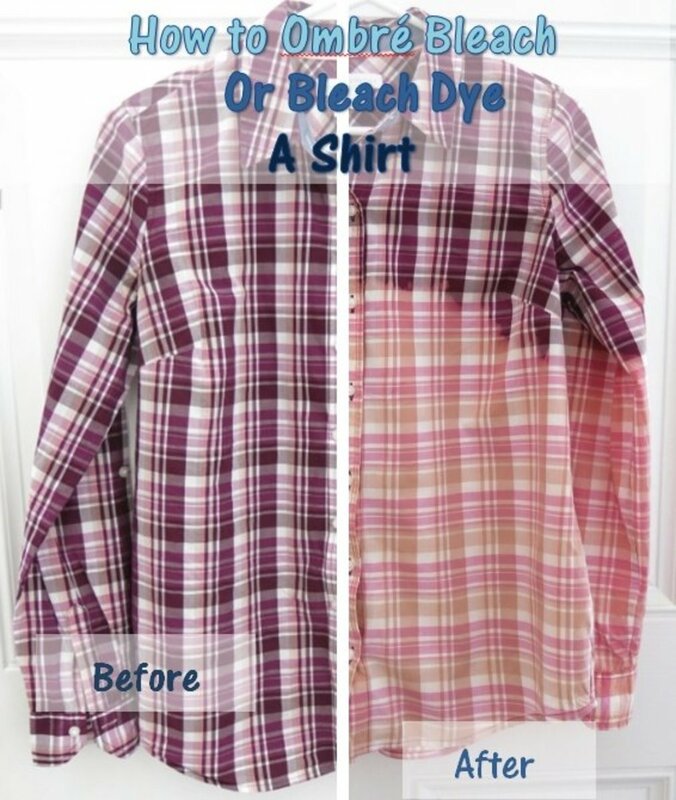 Continue to pull your shirt out of the bleach mixture at even intervals to get the effect you want. I pulled my sleeves out of the mixture before my last bleaching so they would be slightly different in color than the bottom of my shirt. 9. 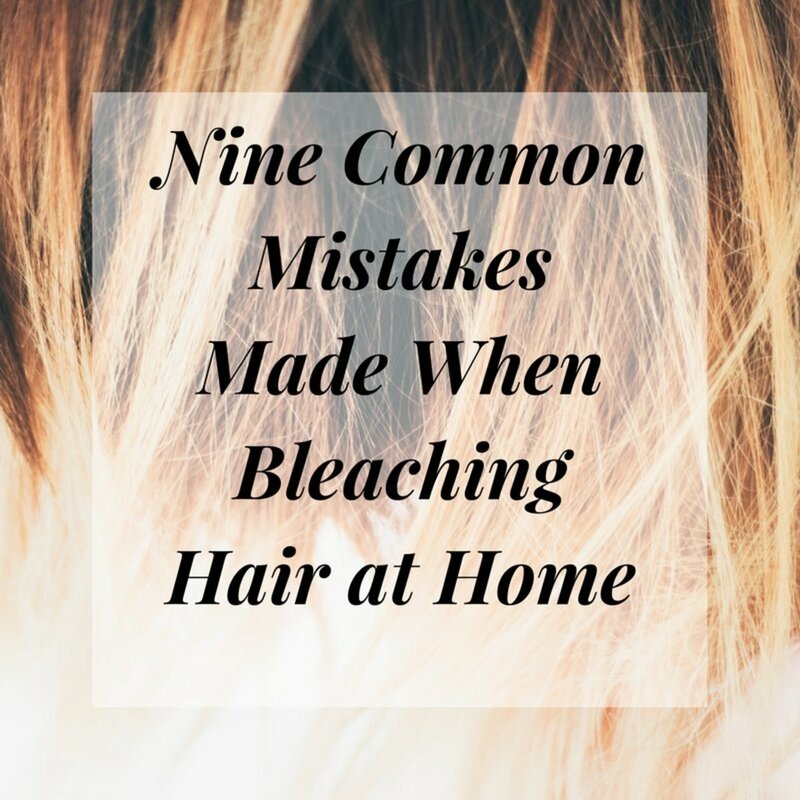 Once your ombré bleaching is complete, submerge your shirt in a bucket of cold water for about 10 minutes. Be careful of dripping your bleach mixture as you move your item. Swish your shirt around in the water to rinse it. 10. 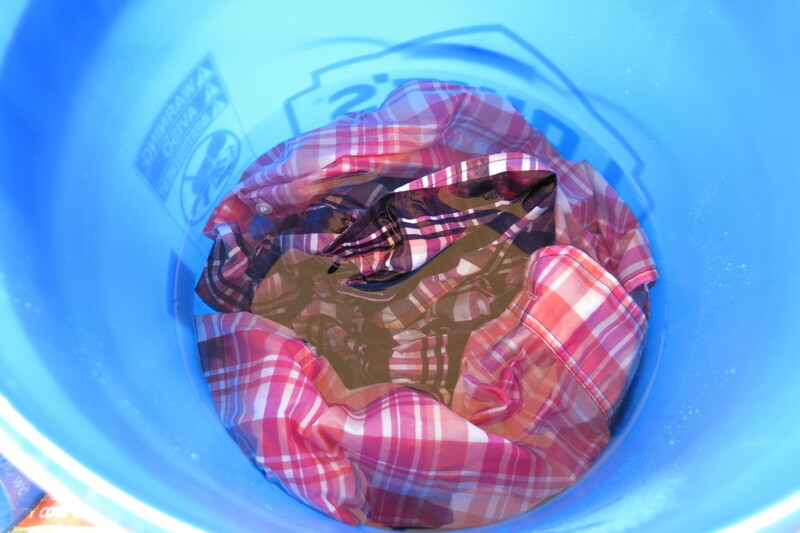 While your shirt is in the cold water, dispose of your bleach mixture in a safe manner. 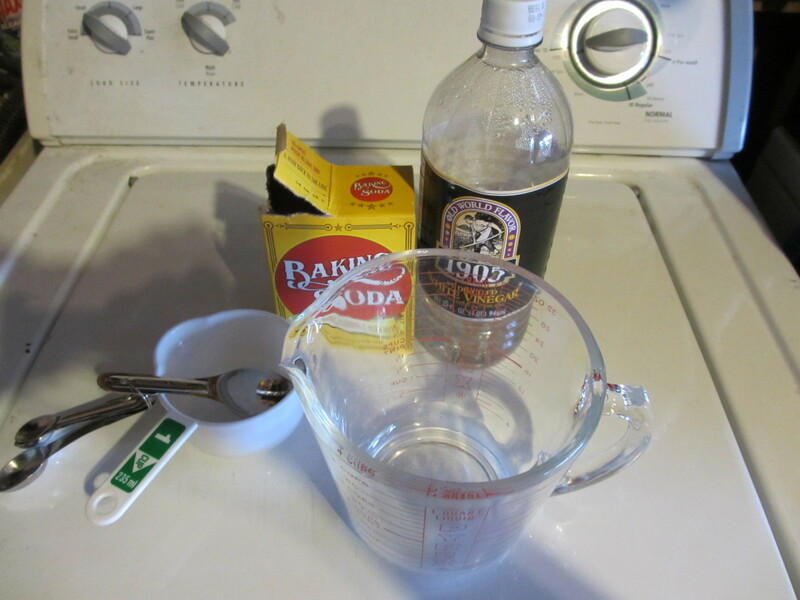 Rinse your bucket and use it to make a mixture of 2/3 cold water to 1/3 distilled white vinegar. Again, these measurements can be approximate. 11. 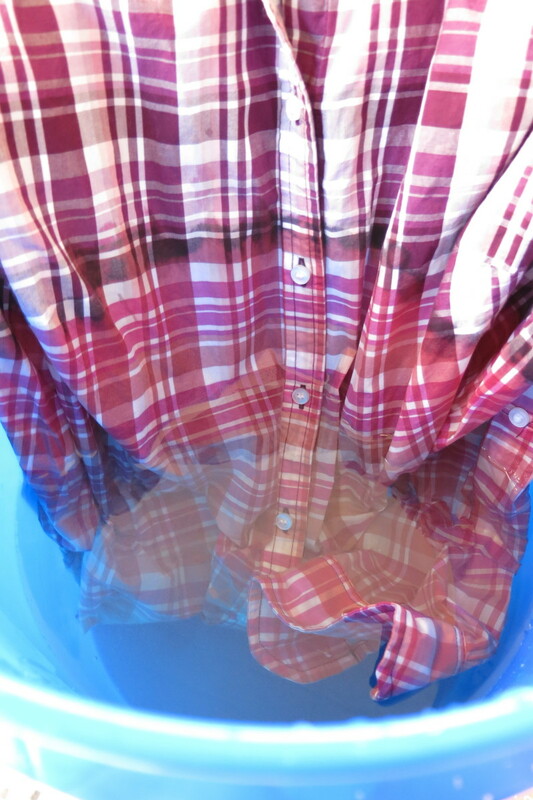 After 10 minutes in the cold water, move your shirt to the distilled vinegar mixture. Leave it to soak for about 10 minutes. The vinegar will stop the action of the bleach on your clothing. 12. After the vinegar soak, wrap your clothing item in an old towel. Wash it in your washer using cold water and a little bit of detergent. Then dry per the instructions on the clothing label. I was surprised but pleased with the color changes in my shirt with ombré bleaching. It's a little hard to tell in the photos, but the bottom of my shirt is paler than the upper bleached area. 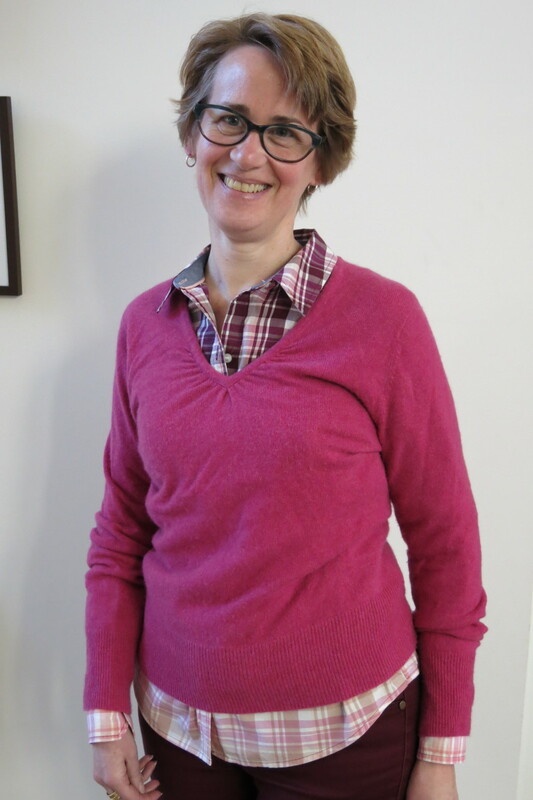 I particularly like how this shirt looks under a sweater for the colder months, with the unbleached section showing at the collar and the bleached bottom hanging out under my sweater. Again, this look might not be for everyone, but you may want to give it a try. You might like it! Great! There's nothing more exciting than wearing something you've made yourself. Enjoy! I love it. I added an metallic appliqué on back that’s says “be happy”. Can’t wait to wear! Sounds beautiful! I hope you like it!! Thanks, Heidi! I accidentally on purpose bleached this shirt a little more than I wanted to and in some places that I didn't intend. But that's part of loving the finished product, even if it's not the result you expected. I actually love the soft pink that the color of this shirt turned to at the bottom. Thanks so much for your comments and share. I appreciate it! I never even knew this was a thing! Thanks for the education. It looks very cool. Would be a good way to repurpose on purpose some items that may have "creatively" (also known as "accidentally") received some bleaching effects from being in the wrong place at the wrong time in the laundry room. :) Sharing! Hi Sally - Thanks so much! 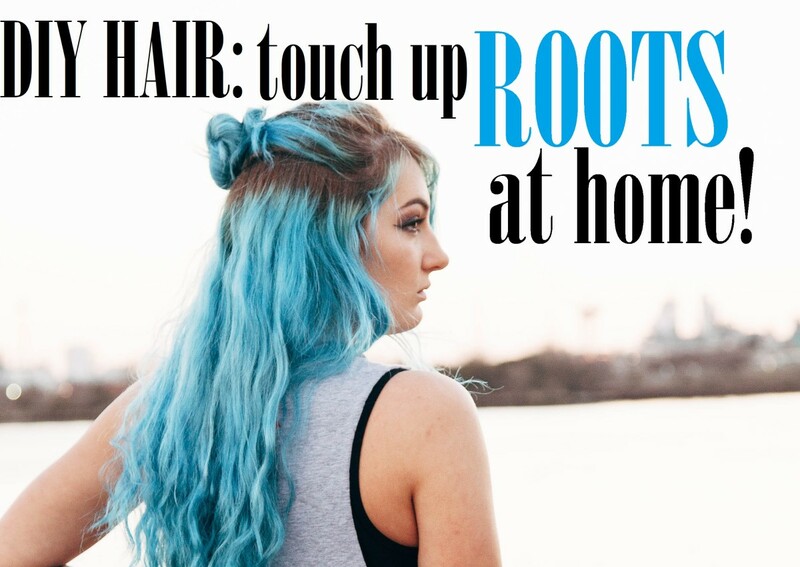 This is a technique that can definitely grow on you. When I first bleached this shirt, I thought I had ruined it. But when it was washed, dried, and pressed I really loved the look. Now it's one of my favorite shirts. Thanks for stopping by and commenting. I appreciate it! Interesting! You taught me something new Donna. 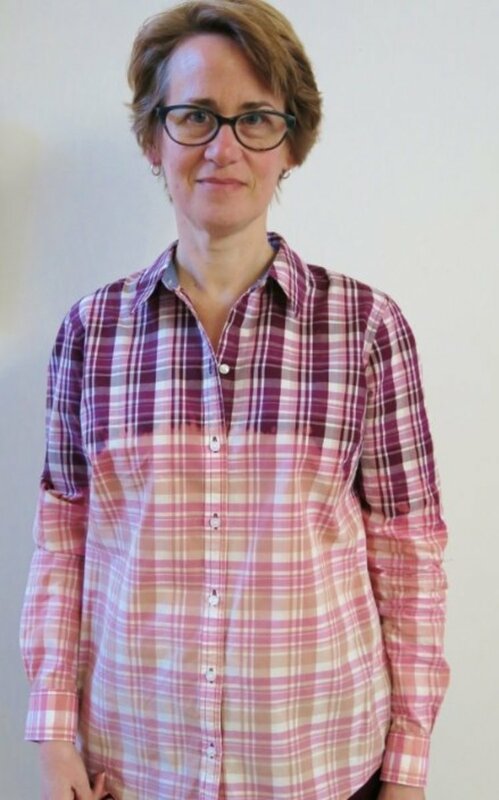 Great to see you looking cheerful and happy in your Ombré dyed shirt. Nice one!